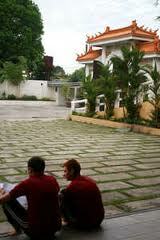 Who wants to live in a Buddha temple in Bacolod for 3 months FREE? Fifteen people will be given a chance to live in a temple stay and study program who want to learn a new way of life, to take a break from the world, and to cultivate spiritually, whatever religious background they are from. The project is called FGS Philippines Humanistic Academy of Life and Arts. This will happen from September 15 – December 15, 2011. This 3-month spiritual program will live in Yuan Thong Temple, Bacolod City with free accomodation and free food. All applicants shall be screened and interviewed by the organizer.